Two-Sentence Summary Castle and the rest of the team at the 12th precinct race to save Beckett from Jerry Tyson and Kelly Neiman. As the hunt for Tyson turns into a kind of psychological war between the mystery writer and the serial killer, Beckett works to free herself from Neiman’s clutches after the plastic surgeon reveals she has special plans for Beckett’s beautiful face. Beckett: Every time I close my eyes, I see her face. Castle: I see his, too—since that night on the bridge. You know how I deal with it? Castle: I open my eyes and look at you. Beckett: Thanks for coming to get me. My Thoughts After seven seasons, Castle can still pull of a February sweeps two-parter like no other show in the business. In fact, it might have pulled off its most riveting two-parter yet with the one-two punch of last week’s twisted “Resurrection” and this week’s breathless “Reckoning.” This was Castle at its very best: confident, intelligent, emotional, and driven by pitch-perfect performances. There was no easing into the action after the chilling cliffhanger of “Resurrection.” From the very start, we were put into Castle’s shoes, and the panicked, dark, increasingly desperate state he was in informed the tone of the episode from its first beats. In the world of television, some things are certain, and those certainties can sometimes keep us from losing ourselves in a storyline. We all knew Beckett couldn’t die, just like we all knew in this season’s premiere that Castle couldn’t be gone forever. However, the mark of a great actor is their ability to make you forget that you know how this is all going to work out. Stana Katic did that as Beckett wrestled with Castle’s disappearance, and Nathan Fillion did that in this episode. We might have known Beckett was going to survive, but Castle didn’t know that. And Fillion had to play Castle’s fear and uncertainty in such a way that it became real for us because it felt so real for him. I think the fact that I spent the majority of this episode watching through my fingers or crying (or both) speaks to how well he was able to get me to connect to Castle’s desperation, despite my knowledge that Beckett was going to be fine. The characteristically excellent direction of Rob Bowman and score by Robert Duncan helped create the episode’s oppressive sense of tension without calling too much attention to themselves. Bowman’s penchant for shadows paired perfectly with the haunting musical cues to create an episode so dark and disturbing that I didn’t want go anywhere alone in the minutes after it was over. “Reckoning” took the psychological gamesmanship on display in all of 3XK’s episodes—but especially last week’s “Resurrection”—to a new level of darkness. It got to the heart of something that’s always fascinated Richard Castle: Why do people kill? What reasons could someone have for taking another’s life? And why do killers target the people they do? We’ve known that Castle has a dark side that will take him to brutal places if the people he loves are in danger; we saw that side of him when Alexis was kidnapped. But Castle’s confrontation with Tyson early in the episode took him to a darker place than we’ve ever seen before. It was a shock to the system to see the generally amiable Castle poised to shoot Tyson before the police officers came in, but it wasn’t an unbelievable shock. In order for that moment to resonate, we needed to believe that Castle could actually pull that trigger, and the cold, determined look in Fillion’s eyes made it clear that this was Castle at his breaking point, so desperate that he’d do anything if he thought it could save Beckett. There was a “caged animal” quality to Fillion’s performance in this episode that worked so well with Castle’s mindset. You could feel the rationality and fierce protective instincts at war in him every moment. It spoke to both the depth of the mental torment Castle has suffered for too long at Tyson’s hands as well as depth of his love for his wife. There was something darkly romantic about how violently desperate Castle was to find Beckett. He’s always been a man defined by his love for his family, and Beckett is now a part of that family in every way imaginable. There was a beat when he said Tyson had his wife, with Fillion’s voice breaking on the word “wife,” and I could feel the tears coming before I could do anything to stop them. 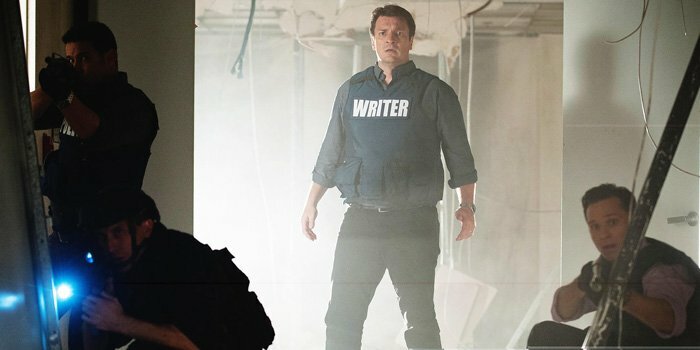 For as strong and determined as Castle was throughout the episode, Fillion underscored it with raw vulnerability, creating the kind of deeply nuanced performance that he excels at in these dramatic Castle episodes. Fillion’s performance was matched by the actors around him, especially Seamus Dever and Penny Johnson Jerald. The scene where Ryan opens up to Castle about his guilt was beautifully done by Dever. That moment had been building since last week and really since Season Four, and Dever gave it the gravitas it needed without making it feel melodramatic. Ryan, like Castle, is a pretty happy guy most of the time, so it was powerful to watch these two very similar men bond over their shared guilt and start to heal from it together. And the scene where Gates told Castle what Beckett said about why their partnership works was a standout moment for me. There was a motherly touch of comfort to Gates in that scene, mixed with her trademark, no-nonsense honesty. Jerald has infused what could have been a cold character with real warmth, and that was evident once again in this episode. As the episode went on, it became clear that this was going to be the final chess match between Castle and Tyson, and the stakes were upped with every scene. Despite knowing the woman who was shot in the empty building wasn’t Beckett, I still found myself overcome with emotion as Castle rushed to her, and that was all because of Fillion. Once again, he was able to make me forget that I knew Beckett was going to be fine and instead put me in the shoes of his character, who completely believed that woman in the chair was his wife. The force of his panic and grief was so strong it left me trying to catch my breath, but what I loved most about his reaction was the way it changed after learning it wasn’t Beckett who was killed. There was a brief moment of relief, but there was no lasting happiness. I loved that this moment was played without the sense of all-consuming joy that a lesser actor would have approached it with. Instead, you could feel immediately Castle’s understanding that the game was going to continue but also his grief that a woman’s life was lost because of that game. Unlike Tyson, who sees people as pawns, Castle sees people as people, and he saw that woman as the victim she was and not just some part of a game plan. The way the last moves unfolded in this great chess match were as close to a perfect ending for the 3XK storyline as I could have hoped to see. Having Castle visit Tyson’s cellmate from Season Three’s “3XK” was an excellent twist and great callback to the show’s past, and their showdown was a fun way to highlight the twisted parallels between Castle and Tyson. Both men are good at reading people, and both men are used to getting their way. Castle’s isn’t above manipulation, but, unlike Tyson, he uses those powers for good and not for murder. Castle understands that every person—from the victims to the killers to the cops—has a story. And the fact that his ability to find the story—the motivation—behind Tyson’s actions is what ultimately led to his victory over Tyson was wonderful. The entire sequence in the old house was brilliant, with just the right amount of creepiness courtesy of Bowman and Duncan. I had my fingers over my eyes for most of it, to be honest. And then when Castle and Tyson squared off one final time, there was such a weight to it that I hung on their every words—and I’m so glad I did. While Castle spent the episode squaring off against his foil in Jerry Tyson, Beckett did the same with Kelly Neiman. Somewhere along the way in the past two seasons, Neiman started to scare me even more than Tyson did. There’s something truly terrifying about a psychopath with the power to change your appearance, so you can’t even die looking like yourself. And Annie Wersching brought such a chilling sense of calm to this twisted character. When she told Beckett about how meeting Jerry helped free a part of her she was never able to let out before, I shivered. While Beckett and Castle bring out the best in each other, Neiman and Tyson enabled the other to be their worst and darkest selves. You couldn’t ask for better, more disturbing foils for Castle and Beckett than these two characters. Neiman’s recurring obsession with Beckett’s face finally paid off in the most horrifying way possible, as we discovered she wanted to use Beckett’s face to hide her own identity. That’s the stuff nightmares are made of. And despite knowing that Castle would find Beckett, I still found myself getting increasingly nervous as Neiman’s worry over not being able to reach Tyson turned into a sense of determination to finish the joy anyway. But Beckett wasn’t going to let her finish the job. And she wasn’t going to wait for Castle to save her, either. This is Kate Beckett we’re talking about—a woman defined by her ability to save herself. The moment when she grabbed Neiman’s hand with the look of a feral animal in her eyes was perhaps my single favorite shot in “Reckoning.” She’s no damsel in distress—even when she’s in a very distressing situation. The romance of the moment didn’t come from Castle saving his wife but from Beckett being able to lean on him after saving herself. At the end of it all, Castle and Beckett still acted as a team without even knowing it, each taking out their foil in spectacular fashion before finding each other once again. The empowering message of that kind of relationship equality is still so rare in the media but has been such a defining part of Castle from its earliest days. Ultimately, things appeared to be back to normal for Castle and Beckett by the episode’s conclusion. He was reinstated at the precinct in the most adorable way imaginable after such a tense hour. And she was home by his side. But the final scene of the episode showed that things can never go back to normal after that kind of ordeal, and that’s an idea Castle has always tried to address in an honest way. The trauma we go through scars us, and now both Beckett and Castle bear scars from Neiman and Tyson, respectively, deepening their connection and partnership in a way I’m sure neither of them wanted it deepened. There was such sad understanding on his face when Beckett talked about closing her eyes and seeing Neiman’s face. Fillion made me feel Castle’s regret that his wife now has to deal with the same ghosts that have haunted him for years. But he comforted her in the way that’s always worked—with his words. Castle telling Beckett that he deals with the traumatic memories by looking at her was one of those lines I’ll remember forever. It could have been so cheesy, but Fillion’s sincerity always makes those kinds of lines ring true. It reminded me of Beckett telling Castle that even on the worst days there’s a possibility for joy. Love doesn’t save you from the bad stuff or make the bad stuff go away, but it certainly makes the bad stuff easier to deal with. The episode ended with an “Always” that harkened back to the earliest ones on the show, when Beckett would thank Castle for being her partner and “Always” was how he would respond. They’ve come so far since those early days, when that one word used to have to say so much they were too afraid to say. But that word still carries so much weight. It’s still his promise to her in difficult times, only now it’s a husband’s promise to his wife. “Reckoning” ended with a sigh of relief—a quiet moment of deep, stable love after an hour of intense emotional instability. It was the perfect way to end this episode, just as this episode was the perfect way to end one of the best arcs in Castle history. I just have to say, WOW… These last 2 episodes have really blown me away, and your review is the icing on the cake. There were so many throw backs to the past in this episode. Castle outsmarting Tyson harks back to the very first episode where Castle tells Beckett he’s well versed in psychological methodologies. Gates reminding Castle that what he’s good at is the story allowed Castle to remove himself from the emotion and figure out the story of Tyson. It was right that Beckett saved herself. To do otherwise would have been a huge disservice to the powerful woman that Beckett is. When Castle and the team burst in to the room, Neiman lying on the floor in a pool of blood and Beckett standing over her with the scalpel in hand dripping in blood I thought back to Serenity with River Tam standing amongst the bodies of the Reavers she has dispatched. Two powerful images… What also sold this scene for me was the fact that Beckett did not immediately jump into Castle’s arms. You could see she was in shock, the entire event seemed surreal. Normal people don’t kill someone with a knife and bounce back and that’s what seperates Beckett from Neiman. For Beckett there are consequences and we saw the weight of that on her face. The return to the precincet reminded me of Beckett’s return in Season 4 ‘Rise’. Although everyone was standing and applauding this time there was no sense of triumph. Beckett was hurting and this time she was not going to put on a happy face. Like you ‘Always’ was the perfect way to end this episode. Just one word conjures up so many memories and holds such a special place in the Castle ‘verse. One last thing, I truly believed Castle was going to shoot Tyson. Thanks for sharing your thoughts with us, Mark! I was especially glad you pointed out Beckett’s reaction when Castle and the rest of the team entered the room after she killed Neiman. It was such a realistic choice to show her still in shock rather than jumping into his arms. It made the moment feel more fragile in a way, which made it even more beautiful. And, as you said, it highlighted the difference between Beckett and Neiman. This isn’t a game to Beckett; she doesn’t enjoy hurting or killing people, which is such a sharp contrast to Neiman and Tyson. This two-parter was creepy as hell and I loved every second of it! Especially “Reckoning” got me at the edge of my seat and left me emotional as never before. Nathan Fillion showed in both episodes his talent as an actor and I just am so impressed by him. He showed it before, but how an actor can get better and better when he was already outstanding and perfect is just amazing! And I was so truly happy to see that Beckett saved herself! I hoped that we could see that and not Castle saving her. She is so strong and clever and I could not get the image of her bloody hand with the scalpel out of my head! Even now I get chills when I think about it! Your review just sums my thoughts up and I am so glad with how they ended this story arc. I’ve always loved Jerry Tyson and Kelly Neiman gave his creepiness another level. Just great acting from the whole cast especially Nathan Fillion and a great two-parter! This show amazes and surprises me so much, even after 7 seasons! Thanks for sharing your thoughts with us! It’s so much fun to bask in everyone’s enjoyment concerning this episode and this show’s ability to pull off something so great so far into its run. I am completely in awe of Nathan Fillion’s acting in this two part episode, and this season. I have to say this is definitely going to be Castle’s season. This is going to be the season where Nathan Fillion gets the opportunity to shine at every chance he could get, and I am loving it. As much I adored the Johanna Beckett story line that took over 6 seasons and watching Beckett through Castle’s eyes, I think it’s time we watch Castle from Beckett’s eyes. I can’t really choose a specific scene out of this episode – everything was fabulous, so intricately interwoven into one intense finale for the 3XK. I really loved how Kevin Ryan got to be the voice of reason just like in “Always”, if it wasn’t for the Kevin Ryan or Javier Esposito, I don’t know what would Castle have done in those moments. More importantly, I love how Gates got to be the person who could make Castle see logic or reason in the choices that the team makes. Time is the last thing that is on Castle’s mind, but with Gates, Ryan, and Esposito – he could wait a little longer so that he could finally end 3XK for once and for all. That scene where Castle screams, “Beckett, no!” is absolutely gut-wrenching, heartbreaking, traumatic and agonizing experience I have ever felt since Under Fire and Veritas. That moment where we all felt Castle’s pain, his fear, his anger. Even though Castle had a brief moment of relief, he still isn’t happy. Someone just died as a pawn in 3XK’s game, and Beckett is still no where to be found. As a viewer, I bought it. Every. Second. Of. That. Scene. Nathan Fillion absolutely brought it. That was an Emmy-worthy scene. Last but not least, Beckett. Despite the fact Stana Katic had limited screen time in this episode, she left an lasting impact that was equally as powerful as Nathan Fillion or any of the costars on Castle. I was impressed that the Castle writers didn’t try to use “damsel-in-the-distress feeling helpless” route. It reminded me of that scene in the motel in Veritas. More importantly, Beckett is a homicide detective. She knows how to defend herself. The moment where Beckett grabs Neiman’s arm and give such a brutal look. That look will definitely haunt me forever. That look has definitely surpassed all the brutal looks I’ve seen in other TV shows or movies. It was definitely in my top faves. I am also impressed by the fact that they didn’t even use any of the cliche reunions between Castle and Beckett. That reunion felt very real. The way Castle slowly approached his wife, just so not to scare her or anything. Then, I saw the look from Beckett’s eyes which I could not even explain it in words but she looked traumatic which just made Castle want to comfort her and tell her it was over. It was going to be okay. Overall, I would rate it 5/5. One of the highest rated episodes so far this season. LOVE IT. Thanks for sharing your feelings with us, and I agree with so much of what you said here. It’s wonderful to see Fillion get some time to shine with this season’s dramatic storylines. I also loved what you said about the show not falling into the trap of a cliched reunion. There was something so haunting realistic about the slow, cautious way Castle and Beckett came together. This show has always done a good job of balancing romance and realism, and this was another moment where that really stood out to me. Your review was AMAZING and spot on. You touched on almost every moment that had me riveted and so impressed. I’ve sent this review to a Castle podcast, hoping they will read it there, of course crediting you. Don’t know if you’ve seen ‘Serenity’, but the shot of Kate from behind with the blood dripping from the scalpel with a host of men with guns pointing at her is a perfect mirror image of the hero shot of River with her dripping weapon and the Alliance soldiers pointing weapons and shouting commands. Too much coincidence? Thank you for the kind words—and for passing this post along! I love Serenity, and I definitely caught the similarities between Kate and River in that moment. There’s no way that was coincidental.